There are few times in my life where I have had a moment that equals to Dorothy's post tornado opening of the door to step out of the shades of grey old farm house into the technicolor world of Oz! That is the best way to describe what it felt like to one moment be in the land of grey, snow and rain which was April in Newport, Vermont, an 36 hours later arrive in Zion! 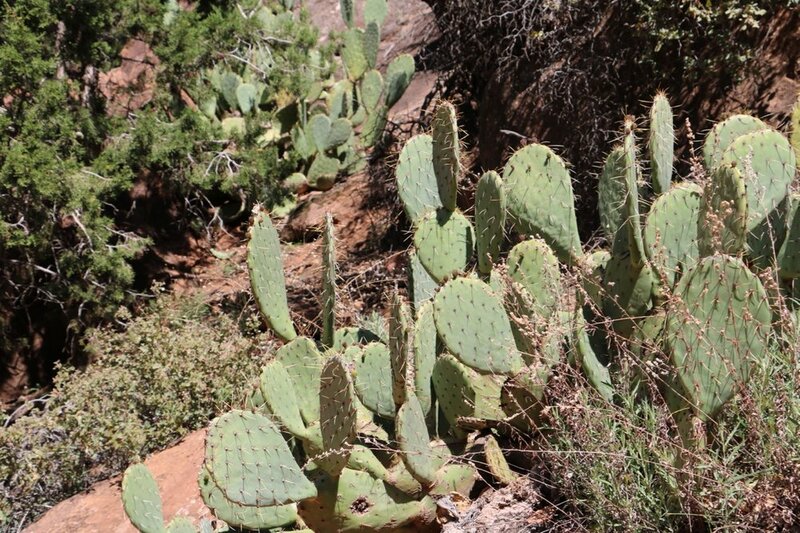 This incredible, lush oasis in the desert is a sensory overload for a visual artist! It is almost as if I had forgotten how to see colors so vivid. 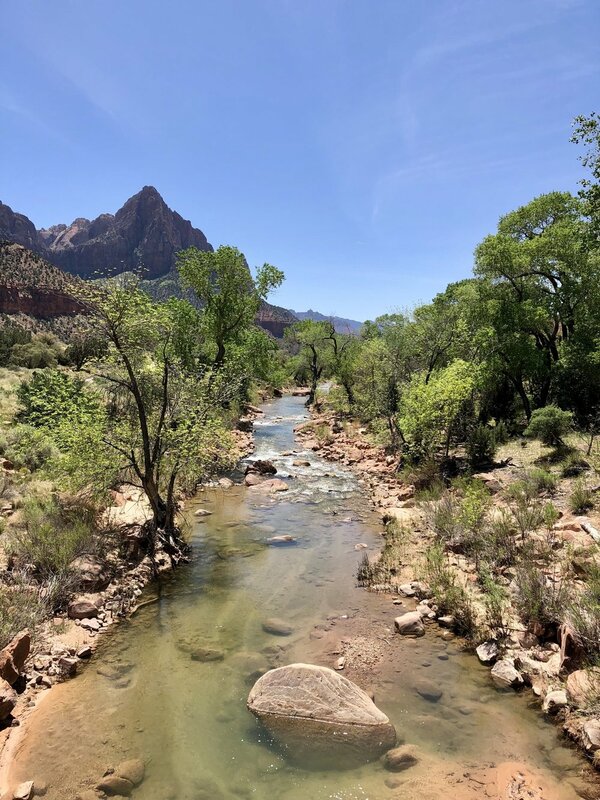 Thanks to thousands of years of water carving through 7 layers of sedimentary rock, the Virgin River has created this towering canyon of white, yellow, orange, and red rising above the river bed and blanket of lush cottonwood trees in shades of blues, and greens. 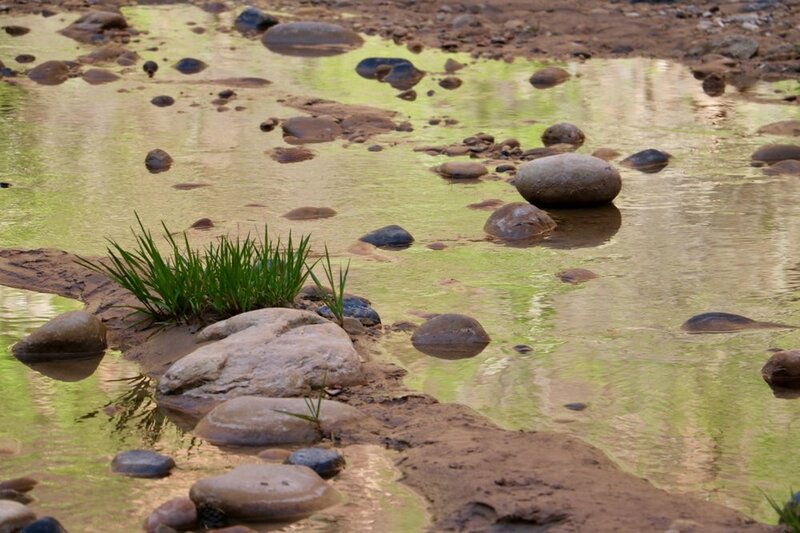 Because of this, Zion has and incredible diversity of environments from high desert and cacti to lush wet vegetation and waterfalls, to wetlands and swampy areas. The diversity is amazing and changes with each turn of the river and rise or drop in elevation. 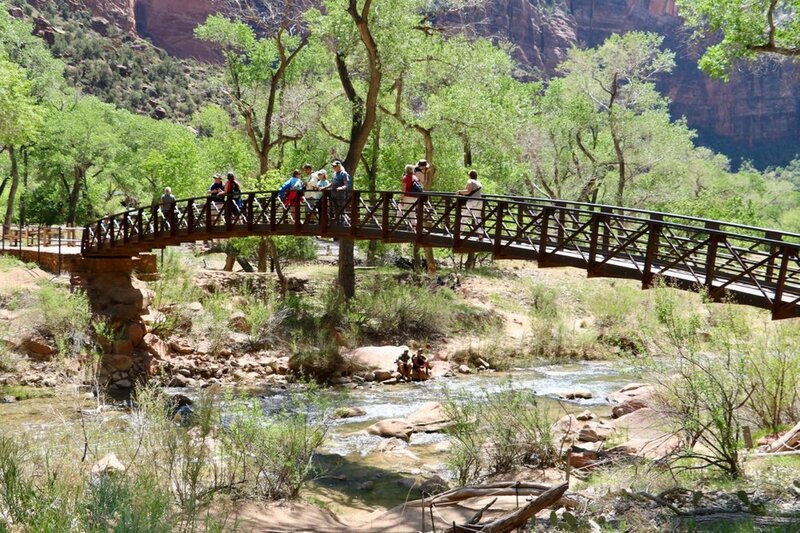 Zion is a hiker and climber's paradise with all varieties of walks and climbs from strolling along the River Walk, or donning the gear or trudge upstream through the Narrows to the steep climb up to Angel's Landing or rock climbing straight up the face of several different peaks. All the while you are very aware of nature being in control here and we, the visitors, rangers, and scientists must yield to its will. Flash floods are a ever present and real danger in this canyon and can arrive with little to no warning. Often these floods change the course of the river, wash out roads, rip out old growth trees, and even take lives. Having that consistent reminder of nature's power makes the ethos of this park much more about allowing the park to be the way it intends itself to be, and less about building infrastructures to force the park to accommodate humans and our needs. 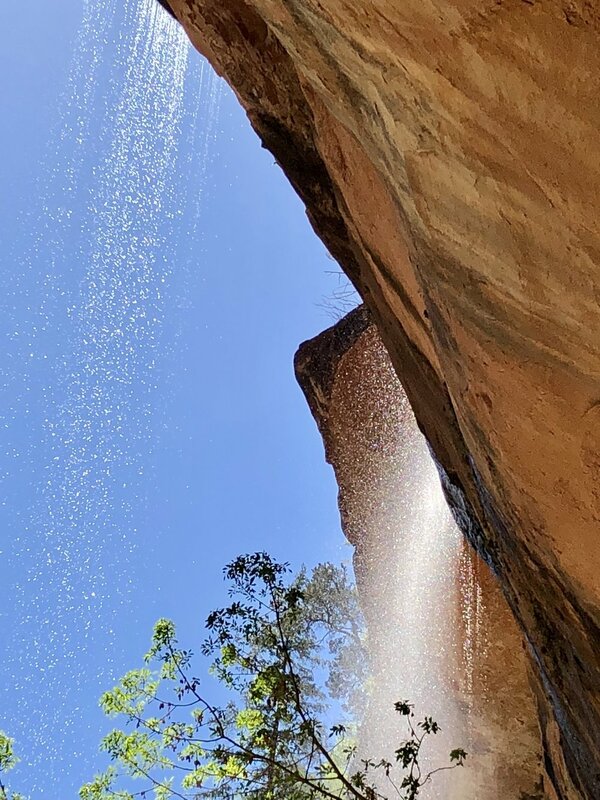 With that in mind, Zion has made some big steps to protecting this place including banning visitor cars in the park - all must use the free park shuttle system that runs continually. 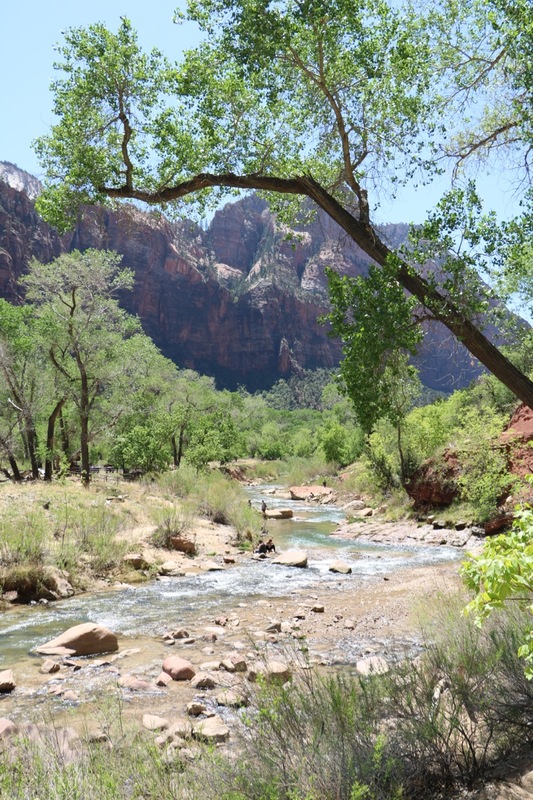 Banning the sale of plastic water bottles inside the park and installing bottle filling stations throughout the area and a user-friendly comprehensive recycling system that is everywhere and well maintained are other examples of Zion moving in the no trace direction for this place. I was also impressed and touched by the very upfront and deliberate interweaving of the beliefs and heritage of the Native Americans of this area and how they see and strive to listen to and protect the land with the scientific facts about conservation, wildlife habitat, and preservation of ecosystems. When speaking about this with a female ranger who has worked at Zion for the past 12 years, she said that these two pieces go hand in hand in their ethos of how the park should be managed. There is a strong presence of the Paiute and Ancient Pueblo People in this area and they respected and protected this land for centuries. Along with them come the history of the Mormon settlers that is an important piece of Utah's tradition that also is recognized. The access to information and science that we have today acts as the virtual 'first aid kit" to help us to repair and restore the land from the damage WE have caused in the 20 and 21st centuries. One of the largest focuses for rangers in this park is about protecting and increasing the populations of the Peregrine Falcons and California Condors. At this time of year, the Peregrine are monitored closely as they are nesting high in the cliffs of Zion and rock climbing and hiking trails are limited and often closed to protect these breeding spaces. In addition Zion has played a major role in the resurgence of the endangered California condor. in 1996 only 20 known California Condors were in existence and were bound for extinction. With the combined efforts of Zion and Pinnacles National Parks, that number in 2017 has risen to almost 400 with 70% of those birds residing in the area of these two National Parks! As an artist, Zion is a wonderland or subject matter and the most difficult part was narrowing it down to my favorite spots to paint and photograph. After a full day of "playing tourist" walking, hiking, photographing, gawking, and chatting with others nearby, I narrowed my sights on three locations for paintings - the entrance to the famed Narrows hike where gear clad hikers head out to walk up river into the slot canyon, sunrising along the River Walk, and the aerial perspective looking down from high above on the Kayenta Trail. Look for each of these coming to you shortly in gallery! On this second road trip I am carrying on my tradition (and tipping of my hat to Ansel Adams) and only shooting black and white with my DSLR. I am really enjoying the juxtaposition of sharing the landscape first in just black and white and them in full color through my paintings. I am also going to try to bring more of the people interacting with these places into my photos at times and capture those spontaneous moments of visitors or workers immersed in their environment as we also play our role in making these places special as public lands for us to enjoy with respect. I think that differentiation is an important one. 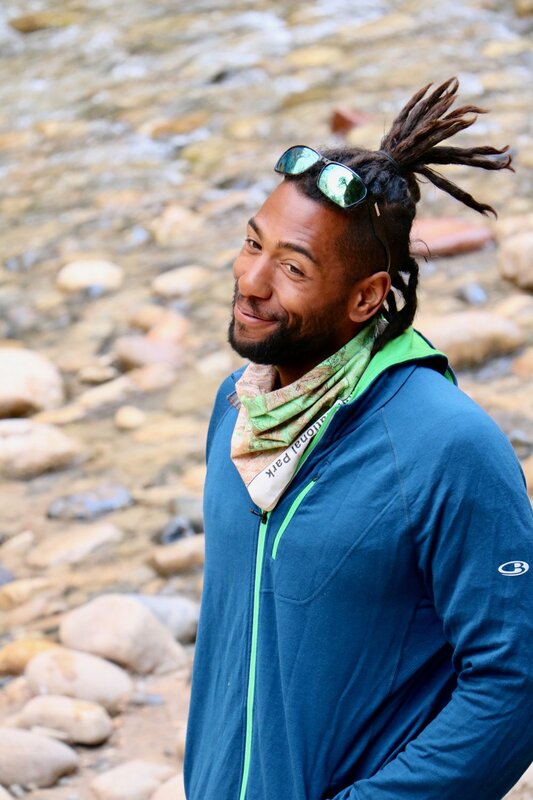 Public lands have to strike a balance between preservation, conservation, and public access (within reason) so generation to come can continue to be inspired by these natural wonders, afford to visit them, and be moved to protect them and on a larger scale the planet as a whole. Older PostFrom Newport to New Haven to a New Road Trip!